The best way to begin any project is to flesh out the core mythos. Unfortunately that’s spoilertastic meanderings that shoot off into an overblown space opera that is grander than I’ll ever be able to implement, so you’ll have to make do with a bit more artwork for now. 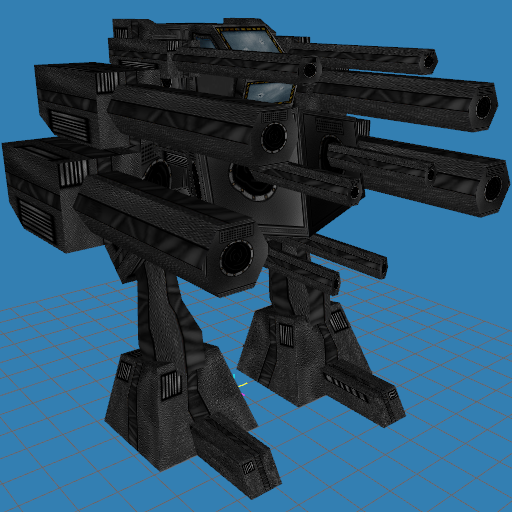 The first Alpha-42 “Destroyer” mech 10 guns on it, of varying size. They were attached in ways that didn’t make much sense, some even floating in mid air around the turret. To be honest, I remember it having more, and it certainly looks like it has more. Nostalgia, eh? I guess their varying size makes them seem worse than they really are. You REALLY don’t want to see the wireframe. The Series Y4 Alpha simultaneously toned it up and down, using four racks of three of the modern Delta’s smaller cannons to give it twelve cannons without the ridiculous. The big thick shield at the front is perhaps the only permanent fixture, with the third leg, the side blast shields and the ability of the turret to actually pivot all being shiny new additions. Because of the unique opportunities finally presented by not using a crap engine, I’m taking it down to eight cannons this time — but the space afforded each now allows a measure of pivoting so the mech can, you know, shoot things that are closer to it than a hundred metres. There’s room on the back for some kind of mortar too, I think, so it hopefully won’t be too underkill in the end. 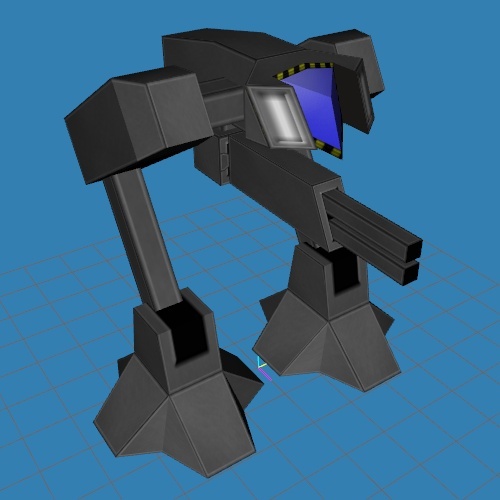 It’s probably too lightly armed to justify the third leg anymore… We’ll need to do something about that. I perked up the standard cannons a bit, adding that bit of danger-tape around the muzzle since unveiling the new Delta. I experimented a bit with a proper muzzle with holes or dimples or whatever real guns actually have (screw research, this is straight from the heart), but my texturing “skills” failed me. There might be weight in it if I try again later, I’m not exactly in a rush. The Beta didn’t exist until Project Y4, so it’s not got much to build on. Born as a fodder unit, it is basically a pair of Delta legs with a single underslung weapon and an AI controller — weaker and less versatile than a full Delta, but quicker and cheaper to manufacture, and faster moving and easier to maintain on the ground. Deploy a horde of them and watch the fun, et cetera. In Project Y4 the Beta was too integrated, though; it lacked the modularity that is supposed to be the hallmark of “present day” RDZ Industries technology. So I did a major rework of the body, adding in the same gun socket that now adorns all the mechs so any modular weapon can be mounted on its underside. The miniature drone controller also comes off, and I’ve completely redone that so it’s more reminiscent of the large drone controller in use these days. The normal rifle seemed slightly redundant against the crystal-spitting shard-rifle so I changed it up a bit. 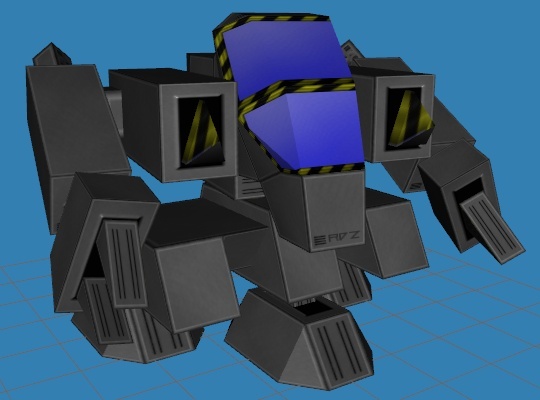 The very original RDZMech was a mining machine rather than a military bot. The story goes that the extremely rugged little vehicle, designed for the harsh conditions of digging into asteroids in deep space, turned out to be as good against security vehicles as it was against rocks. Hahahaha oh come on, we all had to start somewhere. Trying to keep the compact style, but bring in the modular cabin of the Y5 mechs, I ended up adding a third leg. I figured that it was so squat and wide that it would fall over all the time if it only had two legs, whereas the third in the middle means it’s better for caterpillaring along cramped tunnels without pitching all over the place. And, well, it sets the precedent for the Alpha having three legs too. 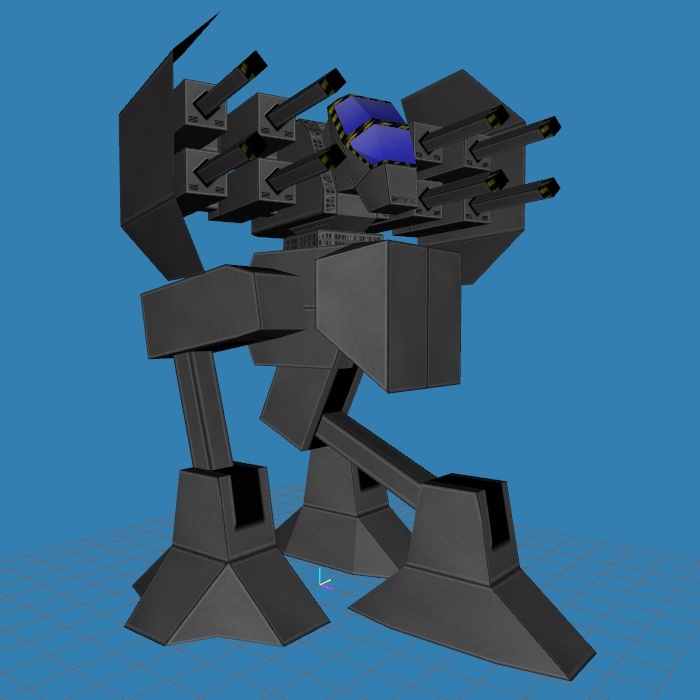 Another update is that it now has a bit of a turret. 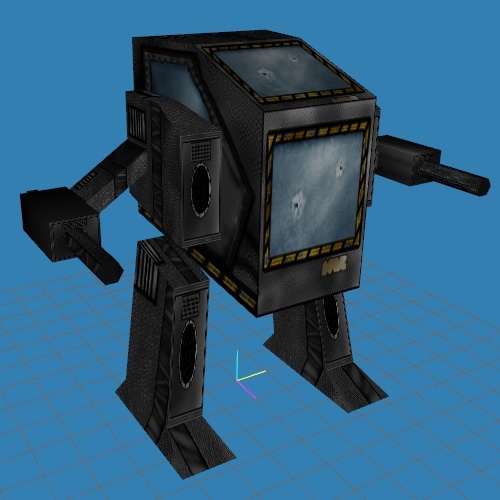 I envisage replacing the mining tool arms with welders and stuff for a repair-bot version. Two claw arms join the rock-smashing pistons to round off this industrial unit. Initially I wasn’t sure about the double arms, but they give it a nice multi-purpose look so I left them on. It’s tough work, bootstrapping a game engine from nothing. Sure, Unity’s done all the hard work, but I need to grapple with how to layer my bits on top of that. Unity has an interesting API, to say the least, and one that’s not entirely condusive to programming best practice. It’s funny, really; because of the supportive work environment I now find myself in, I’ve become a better programmer in the last six months than I’ve ever been in my life, while Unity is now trying its level best to make me fall for old bad habits. Because I’m doing NO EXCUSES in C#, and C# is the order of the day at the office, it is luckily hard to resist the pull of doing it right. There is no more convenient context-switch to hide behind like there was with Project Y4. The downside is that everything takes ages to get started. On the other hand, once I have this introductory phase out the way, it should be super-smooth and maintainable and extensible in the future. I’ll have an engine designed to do the things I want, and only the things I want, and then I can shoot off into space with it. It’s an investment in the future, right? This entry was posted in Game Development and tagged milkshape 3d, No Excuses, rdz industries, Series Y5, Unity3D by Rao Dao Zao. Bookmark the permalink. Getting more skilled at work = nice.